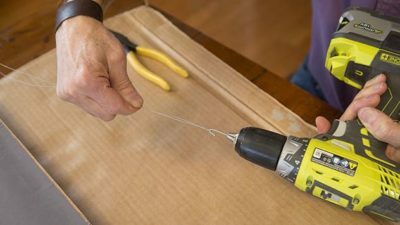 You can make picture wire with everyday household items including a power drill, galvanized wire and a nail. Braided wire is a top choice for hanging pictures because it’s so much stronger than a single piece of wire. But that strength comes at a hefty price. Joe Truini knew he could make his own picture wire with galvanized wire he had on hand. 1. Cut the wire two times longer than the distance between the picture frame’s D hooks. 7. Squeeze the power drill’s trigger and watch the pieces of wire twist! That’s it! You have a more economical solution to braided picture wire.